Air Products and Chemicals, Inc. (APD) provides atmospheric gases, process and specialty gases, performance materials, equipment, and services worldwide. This dividend aristocrat has paid distributions since 1954 and increased dividends on its common stock for 30 years in a row. The company’s last dividend increase was in March 2012 when the Board of Directors approved a 10.30% increase to 64 cents/share. The company’s largest competitors include Airgas (ARG), Praxair (PX) and Air Liquide (AIQUY). Over the past decade this dividend growth stock has delivered an annualized total return of 7.10% to its shareholders. The company has managed to deliver 10% in annual EPS growth since 2002. 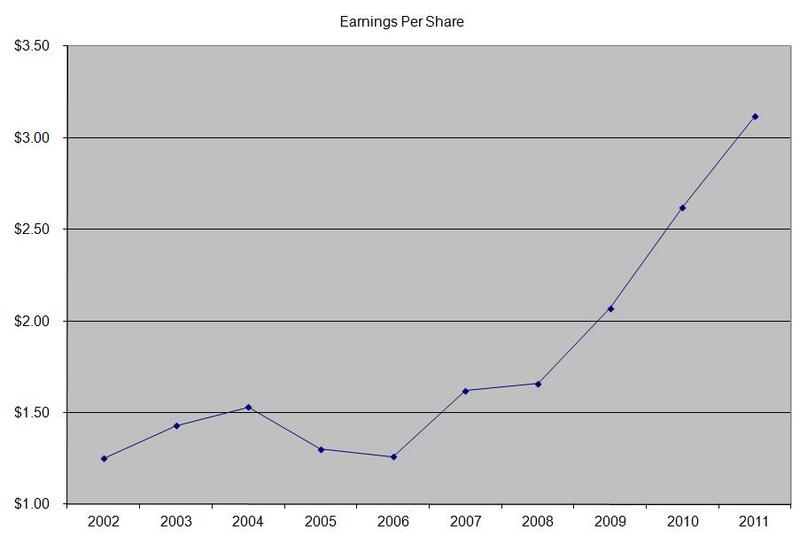 Analysts expect Air Products and Chemicals to earn $5.57 per share in 2012 and $6.35 per share in 2013. 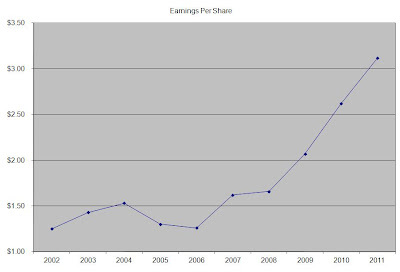 In comparison Air Products and Chemicals earned $5.59/share in 2011. Air Products and Chemicals is expected to post a 5% growth in sales, due to strong demand for industrial gases in rapidly growing economies in Asia. Long term growth will be driven by acquisitions, expansion into rapidly growing markets in South America and Asia. In addition, new business initiatives such as its Tonnage Gases Business will lead to 10 – 15% increases in EPS by 2013. 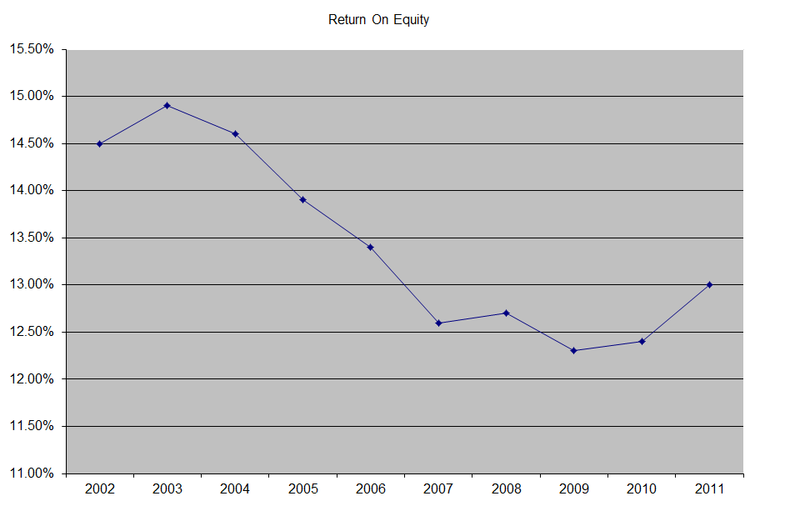 The return on equity has increased from 16% in 2002 to 22% in 2011. Rather than focus on absolute values for this indicator, I generally want to see at least a stable return on equity over time. 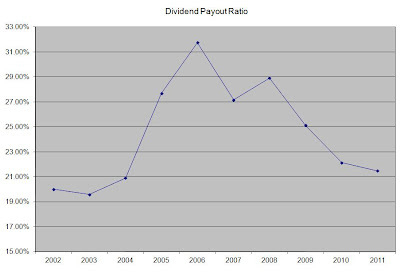 The dividend payout ratio remained at or below 40% over the past decade, with the exception of two brief spikes in 2003 and 2009. A lower payout is always a plus, since it leaves room for consistent dividend growth minimizing the impact of short-term fluctuations in earnings. Currently, Air Products and Chemicals is attractively valued at 14 times earnings, yields 3.20% and has an adequately covered dividend. I would consider adding to my position in the stock subject to availability of funds. The company is in the business of acquiring triple-net lease properties from owners, and then leasing them back using long-term lease contracts. 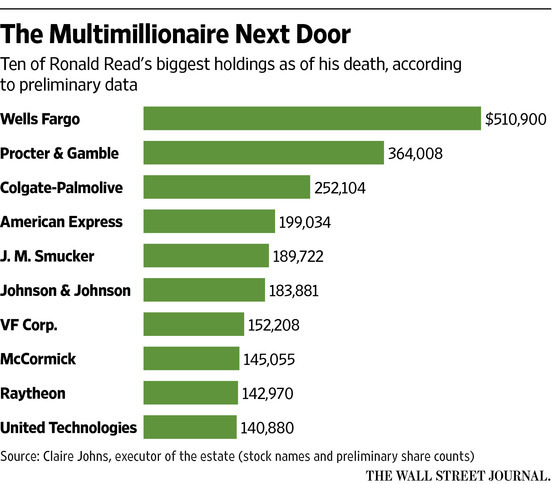 As a Real Estate Investment trust, the company has to distribute almost all of its net income to shareholders. 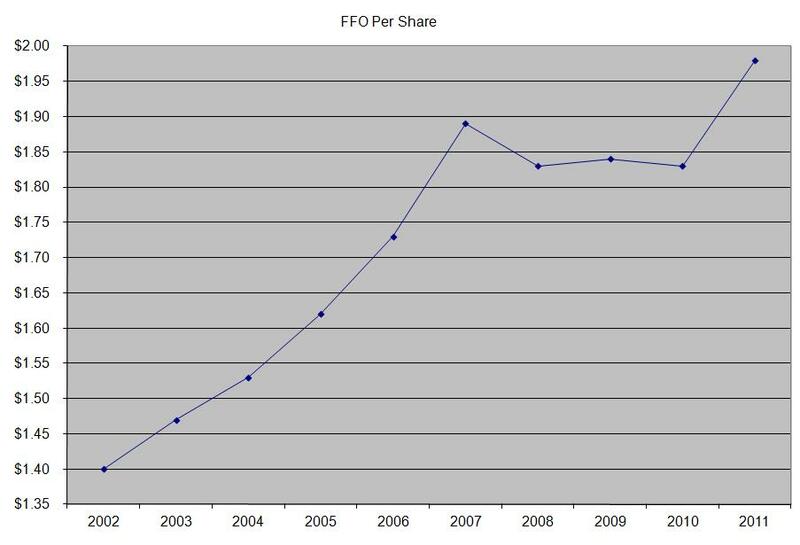 An important metric for evaluating REITs is Funds from operations (FFO), which stood at $1.98/share in 2011. Realty Income distributed $1.746 /share in 2011. 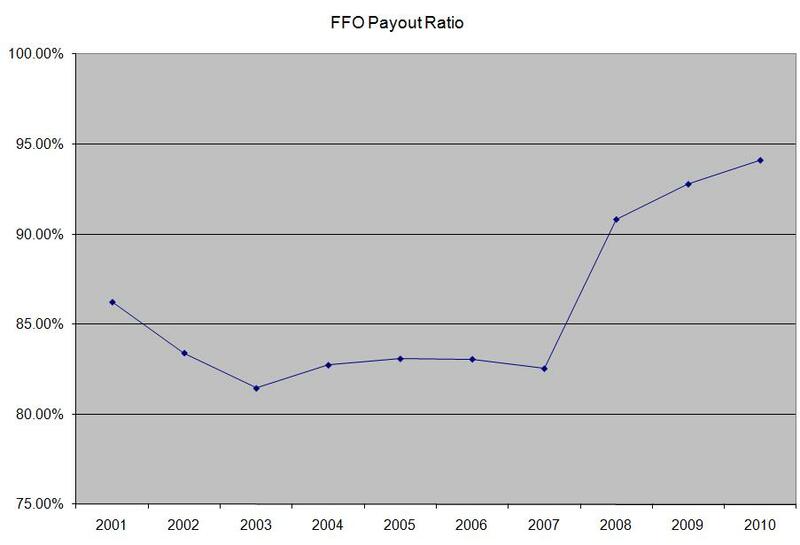 This strategy has enabled to company to pay a stable and increasing distributions since it went public in 1994. The company has been successful in adapting its business model to changes in the economy. In its property acquisition strategy, Realty Income has exclusively focused on tenant quality. Examples of that include the acquisition of vineyard and winery assets in Napa Valley, which are leased to Diageo (DEO). This shows the company’s willingness to invest in retail industries where there is little competition and that are likely to do well in the future. Realty income has also managed to continuously re-evaluate its existing group of tenants, using its methodology, and group them into different clusters. It’s team of research staff has evaluated tenants based on a wide variety of factors such as revenue and gross margin trends, profitability, credit rating, including stress tests and what if scenarios if interest rates increased or if tenant revenues declined. This evaluation helps the company identify industries in which it needs to focus its acquisition efforts, while also identifying areas where it needs to scale back or even dispose of existing properties. Some of the biggest risks that the company faces include decrease in occupancy rates, competition of its tenants and rising interest rates. The company has managed to proactively acquire properties in promising industries over the years. However, if its team fails to renew leases as they expire, Realty Income might end up with properties which are not generating income and might have to be sold. Between 3% and 4% of leases expire each year, which is why being able to renew or find new tenants is imperative for long-term success. Inability to do so could decrease cash flow available to shareholders, and might even lead to reduced dividend payouts. In addition, deterioration in the financial conditions of its tenants might lead to them breaking leases, depending on the severity of their financial situation. 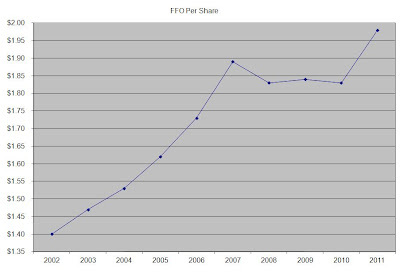 The company’s tenant base does appear to be somewhat diversified, although about ten tenants account for 50% of revenues in 2011. The company does look at its properties, and is not afraid to sell real estate in order to reduce credit risk. Over the past year, two of its tenants which generated 7% of annual revenues, Friendly’s and Buffets Holding filed for bankruptcy under Chapter 11. Friendly’s accepted 102 out of 121 leases, and received rent concessions and term reductions on some of their leases. The company estimates that it will be able to recover 80% of annualized rent that Friendly’s was paying prior to its bankruptcy. Buffets accepted 79 out of 86 properties, and obtained term reductions and rent concessions from Realty Income. The REIT is expecting to recover 65% of annualized rent that Buffets was paying before its bankruptcy. The rejected properties have been made available for re-lease. Realty income does face a great deal of competition from other public and private REITS, as well as an array of investors, who are actively looking to increase exposure into the lucrative triple-lease property market. Luckily, the company has been able to proactively pursue opportunities in new markets. In addition, its expertise and experience in the sale-leaseback market has allowed it to uncover opportunities. The decrease in interest rates has led to a decrease in cost of capital, which has been sufficient to compensate for lower yields on new properties. Another major factor behind Realty Income is rising interest rates. Although expectations are for interest rates to remain low until 2014, a continued increase would diminish investor appetite for high yield REIT’s and their fixed income securities. This will essentially increase cost of capital, and might even cause liquidity issues. Realty income has been able to grow through issuance of equity and bonds, which is why future growth could be in jeopardy if it has to pay higher interest rates to investors. One of my favorite lists for dividend growth investing is the dividend aristocrats index. 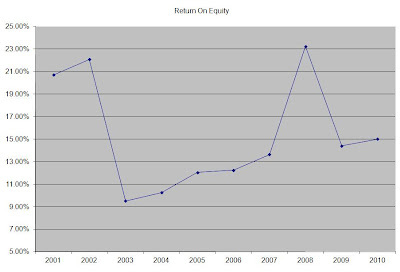 It features companies in the S&P composite index, which have managed to increase distributions for at least 25 consecutive years. 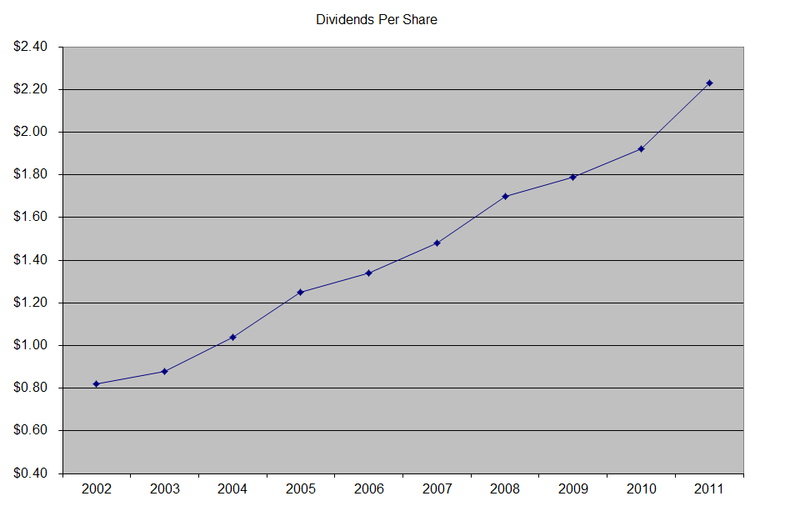 There are 51 dividend aristocrats in the list. 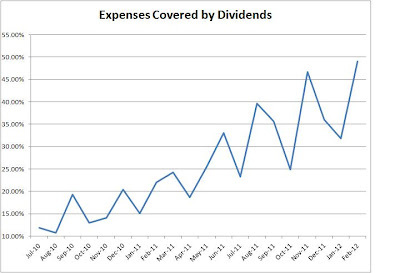 So far this year, 25 of them have announced dividend increases. 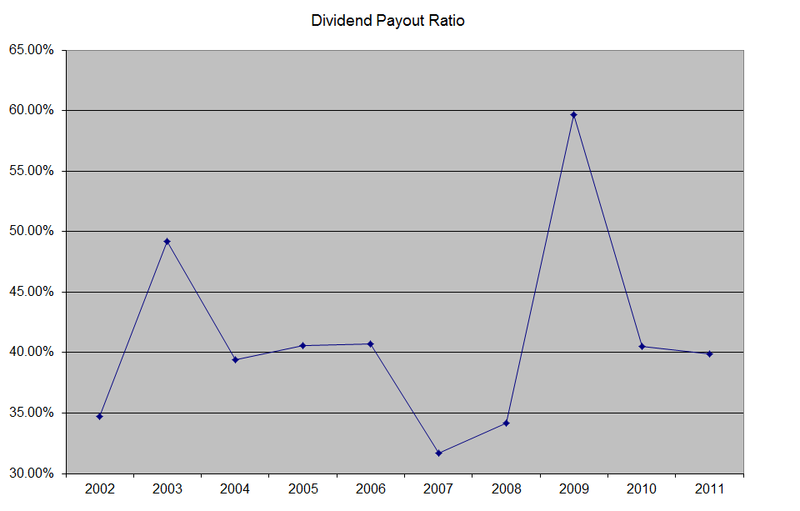 A dividend increase signals confidence in the near term financial position in the firm that announces it. I scrolled through the list, and identified the six companies that managed to boost distributions by more than 10%. If a company boosts dividends by 10% per year, its dividend payment would double in seven years. In other words, if you purchased $1000 worth of a dividend stock yielding 3% today, in 7 years your dividend income would be $60, or a cool 6% yield on cost. I have listed each one below, included some detail about the company as well as an overview. W.W. Grainger, Inc. (GWW) engages in the distribution of maintenance, repair, and operating supplies, as well as other related products and services for businesses and institutions primarily in the United States and Canada. The company raised its annual dividend by 21.20% to $3.20/share. This dividend aristocrat has raised distributions for 41 years in a row. The ten year annual dividend growth rate has been 13.70% on average. W.W. Grainger is trading at 20 times earnings and yields 1.70%. I would consider adding to my position in the stock on dips below $130. Sigma-Aldrich Corporation (SIAL), a life science and high technology company, develops, manufactures, purchases, and distributes various chemicals, biochemicals, and equipment worldwide. 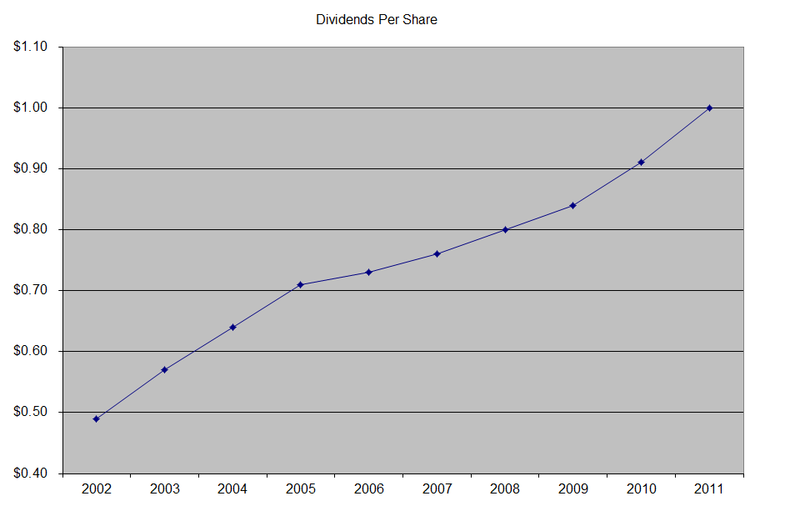 The company raised its annual dividend by 11.10% to $0.80/share. 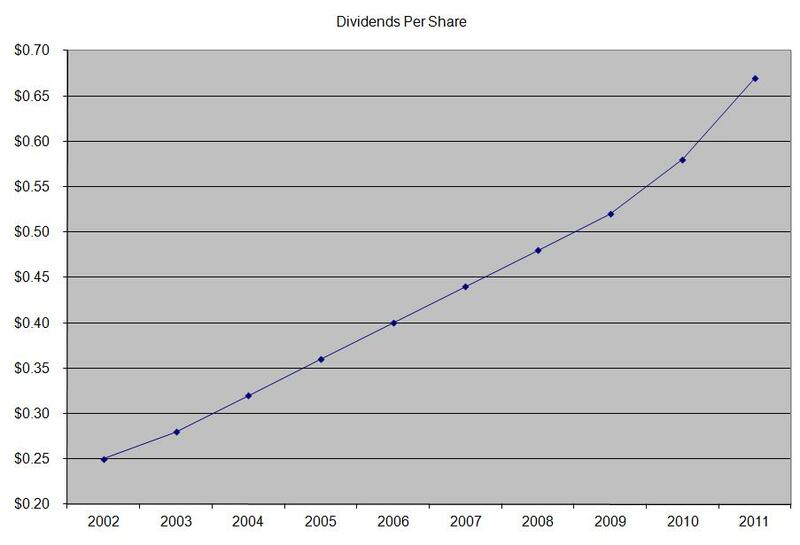 This dividend aristocrat has raised distributions for 36 years in a row. The ten year annual dividend growth rate has been 15.90% on average. Sigma-Aldrich is trading at 18 times earnings and yields 1.20%. The low yield has prevented me from initiating a position in the stock. Over the past decade this dividend growth stock has delivered an annualized total return of 13.40% to its shareholders in US dollars. 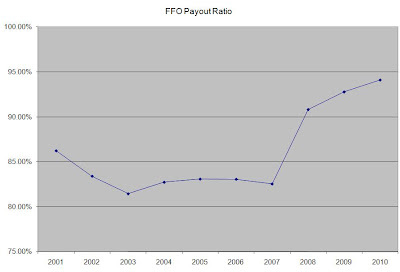 A large portion of the gain came from the appreciation of the Swiss franc from $0.60 in early 2002 to $1.10 in early 2012. US investors can purchase the ADR’s of Nestle, which are traded on the pink sheets under symbol NSRGY. 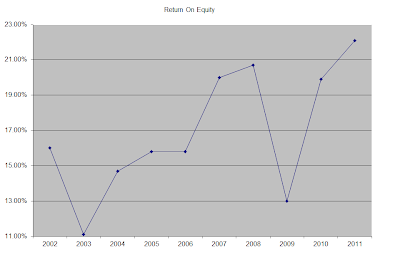 (or NSRGY.PK at yahoo finance). The fact that this company is traded on the pink sheets, rather than NYSE, NASDAQ or AMEX should not scare potential investors. Nestle is a global blue chip, based in Switzerland, which has not only managed to increase earnings over the past decade, but also to share the wealth with shareholders in the form of increased dividends and consistent share buybacks. The company has managed to deliver 7.60% in annual EPS growth since 2001. Nestle is well positioned to ride the increasing affluence of emerging markets with its strong presence throughout the emerging markets. In fact, 40 % of the company’s sales came from emerging economies. Understanding local markets and strategic acquisitions will be the key to future success. Another division that could drive future growth is Nestle Health Science division, which began operations in January 2011. This division is an attempt to pioneer a new market between food and pharmaceuticals and to develop science-based personalized nutrition solutions to chronic medical conditions. The company has been able to generate strong organic growth in key areas such as North America, Europe and Asia through several factors. Some of them include product innovation, leveraging the company’s global scale, investing in building and maintaining the company’s strong brand positions worldwide. The company has 29 billionaire brands, which have delivered strong organic growth over the past few years as well. Nestle’s long term goal is to generate 5% - 6% in annual organic sales growth, achieve sustainable improvement in EBIT and improving the trend in return on investment capital. 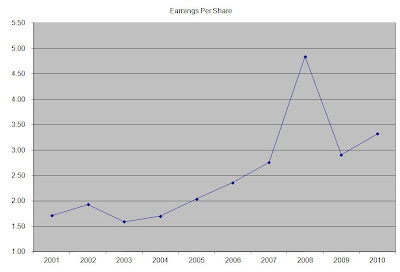 A large spike in earnings per share in 2010 was caused by the sale of Alcon to Novartis. I did not account for these one-time effects in this analysis.